China is expected to achieve a "major breakthrough" in nuclear-powered space shuttles by around 2040, according to a report issued by the China Aerospace Science and Technology Corporation on Thursday. The company is considered the "cradle of China's carrier rockets." The breakthrough will support large-scale explorations and the development of space resources, and make mining on asteroids and establishing space solar power plants possible, the report said. 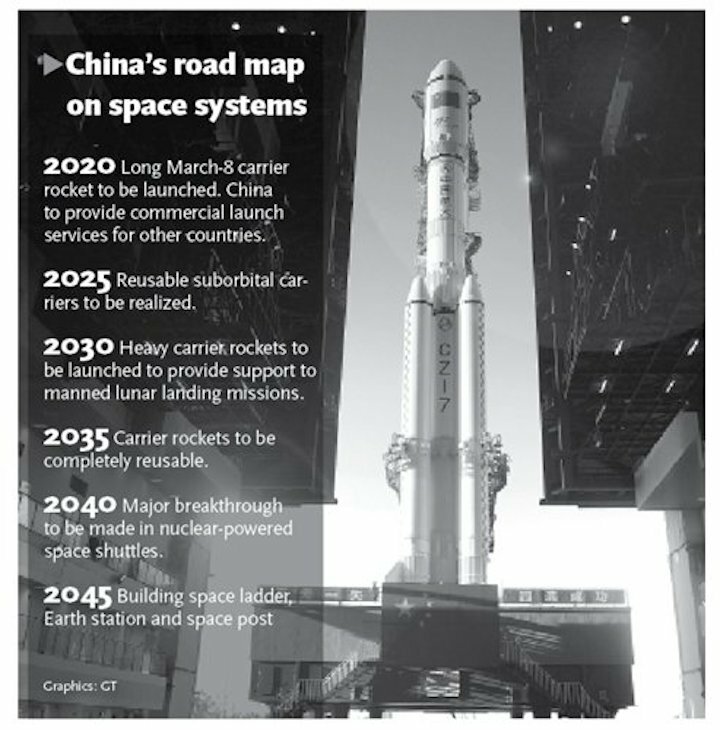 It outlines the development road map for China's space transportation system until 2045. "Nuclear-powered space shuttles are mainly used for long-distance space travel and deep space exploration. They are the cornerstone for the Mars space stations," Jiao Weixin, a Peking University space science professor, told the Global Times. "Given China's progress in miniature nuclear reactors, such as the maritime nuclear stations, it is possible to use similar technology in space shuttles," Jiao noted. He said the nuclear-powered space shuttles will stay in orbit and will not land on Earth or other planets, reducing the risk of possible radioactive contamination. A future generation of carrier rockets will be put into use around 2040 and hybrid power reusable carriers will be developed, the report said. By 2045, the means to get in and out of space as well as space transportation will see radical transformations, making it possible to build a space ladder, Earth station and space post, as well as regularly explore the solar system on a large scale with coordination between humans and machines, the report added. The report also said that the Long March-8 carrier rocket is expected to be launched in 2020, with the Long March series providing commercial launch services for other countries. Around 2025, reusable suborbital carriers will be successfully developed and suborbital space travel will come true, it said. Around 2030, heavy carrier rockets will be launched to provide support to manned lunar landing missions and sufficient transportation power for samples from Mars. And around 2035, carrier rockets will be completely reusable and the future generation of intelligent carrier rockets with advanced power will be launched, the report said.